two points for honesty: sooo ya wanna cupcake? I have absolutely no will power when it comes to turning away a cupcake. Like, it can not even look that appetizing and I will still snarf it right down. Basically gimme some cake and frosting in a handheld tin and it's game on. But especially...especially when they are 1) pumpkin cupcakes 2) stuffed with something 3) decorated with monster eyes. I mean those eyes basically looked at me and said, "EAT ME NOW BEYOTCH." I do not tell a lie. So I HAVE to share this recipe because it's just plain RUDE not to share something so amazing and surprisingly simple. A lot of people thing cupcakes and gourmet cupcakes are super tricky and complicated...they're really not. In bowl or stand mixer cream butter, granulated sugar and brown sugar until creamy. In bowl of stand mixer beat butter and cream cheese on medium speed until well combined. Place icing in piping bag fitted with a large round tip and frost cupcakes. (*I didn't have any tips, so I just put it in a bag and cut off the end- worked just as well). Also if you're planning on filling them, do that before you frost them...naturally. Filling cupcakes is NOT hard..and it for reals makes them taste soo much better. I think every cupcake everywhere should be filled always. All you have to do is think of a complimentary flavor and wah-lah! You can use fruit preserves, other frosting flavors, chocolate ganache...I really think it's hard to go wrong. I don't have a melon baller (what a lot of people use to scoop them) or any fancy baker tools...but a good 'ole knife does the trick just fine- we keep it simple in this kitchen. Hold the knife at an angle and cut a circle. Pick up the piece you just cut out and eat it. Spoon the filling into the center. Done and done. If you don't want to fill them you can also drizzle some of the deliciousness on top of the frosting instead. Or fill AND drizzle...go big or go home, right? These were for a Halloween party- hence the decorations. 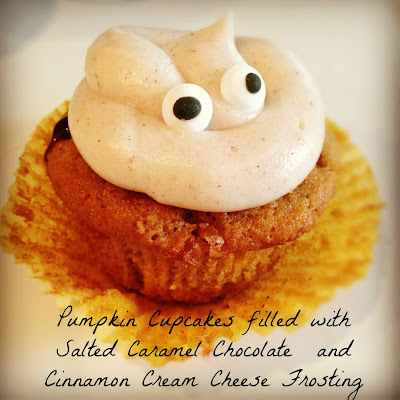 But for reals, if/WHEN I open my own bakery these will be on the menu...all year round...because pumpkin definitely gets the shaft by only being served three months out of the year.